Posted by Ada Wang on 11/19/2018 4:09:03 PM. Kindle Collections are a classification of the folders on the kindle device which help you organize kindle content. If you have got lots of eBooks on Kindle library, you should create collections to manage your ebooks in good order. In fact, there are 6 methods to help you manage your kindle books. 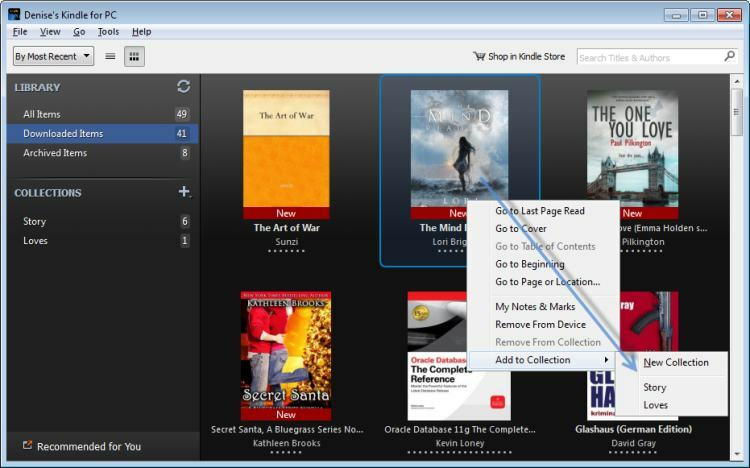 In 2017, Amazon has added a new function of creating and managing collections for Kindle books in cloud which is very convenient for users. Now you can create and manage your kindle books at "Manage Your Content and Devices". Go to your Amazon account and choose "Manage Your Content and Devices". Then click " Your Content", and choose "Collections" at the drop down list of show. Then you will see " Create new collection" button and just click it, it will pop up another window. You just have to enter the name of this collection. A new collection has been created so easily. Click on the button before the book title and choose " Add to collections". 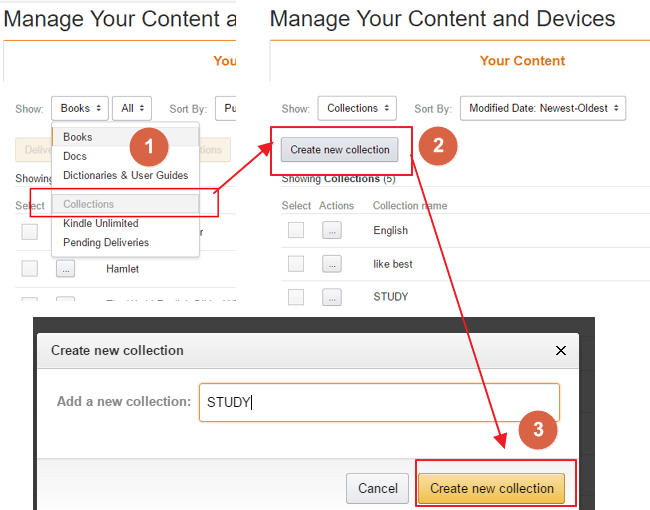 Then a dialog box will pop up which allows you to select already existed collections or create new collection. You even can select more than one collection to add this book to. When all these have been done, you just have to go to your kindle device and choose " Sync and check for Items" at the menu. Then all created collections will be shown in cloud. Cons: Amazon only allows you to manage the books that you have purchased from Amazon store. Q: If I delete the collection, will the books added to this collection will be deleted? A: The books in collections will not be deleted at the same time. 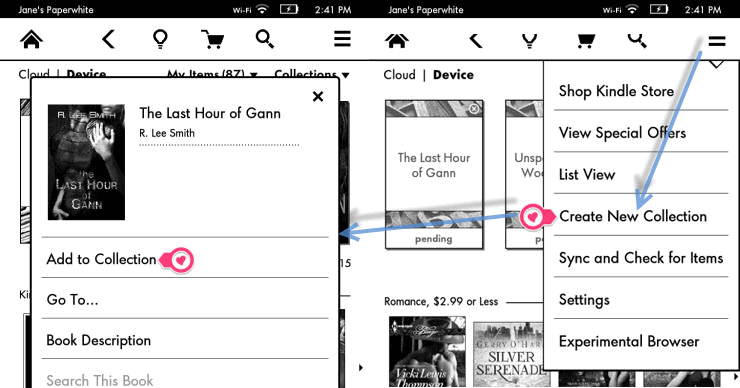 For Kindle Paperwhite users, go forward to the Home screen and select "Create New Collection" from the menu. Create and name your collection by date, author name, subject and so on. Here are a few of my collections as follows: New to read, Currently reading, Samples, Non-fiction, Horror, Historical, Sci-Fi& Fantasy, Reference. Press and hold the cover of ebook. Select "Add to Collection" from the popped up box. Then check the box next to the new collection where you want the book to appear. At last, press Done at the bottom of the screen. Navigate to a collection, you can add or remove items from the menu. Cons: If you have 500 books in your Kindle, it's a huge workload to organize these books in order one by one. And this method is only applied to purchased books from Amazon. Q: Why do my books appear in "Documents from My items" and not in "Books from My items"? A: Docs are the ones that you send to yourself by email, but not purchased directly from Amazon. First, this following step will take Kindle for PC as an example. If you use Kindle for Mac and encounter operating problems, please leave your reply. 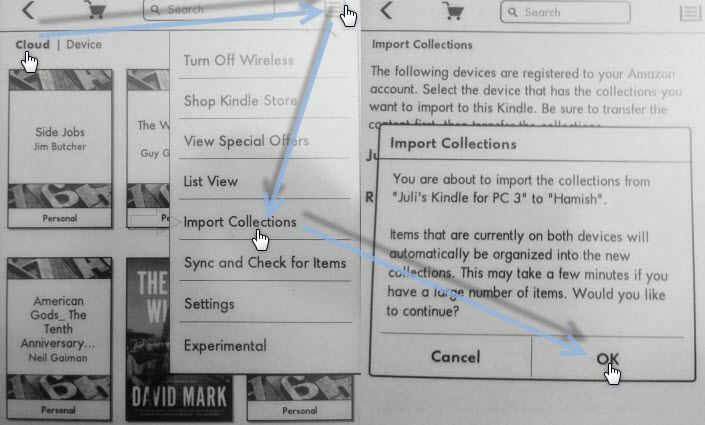 Compared with the method 1, using the desktop kindle app is easier to set up and manage kindle collections. Make sure that you have logged in Kindle for PC with Amazon account. Right click the cover of ebook and select the "Add to Collection" from the drop down list. Click "New Collection" and name the title of the collection. And you can also move the book cover to collections which you have created by holding the left mouse without loose. Login your kindle device (only for kindle paperwhite/kindle touch) with the same Amazon account. Hit Home and then Menu and tap "Sync and Check for Items". Switch to Cloud View, open the menu and select "Import Collections". Then select "OK" on the pop up screen. Wait for a moment, all books will appear in the corresponding collections in order. Congratulations! Conclusion 1: The method 1 and 2 above can only are applied to Kindle paperwhite and Kindle Touch. If you have an older Kindle with keyboard and earlier, please refer to the method 3 and the method 4. Conclusion 2: Both method 1 and 2 above just work effectively with Amazon purchased books. Q: How to transfer collections from Kindle for PC to iPad Kindle app? A: It's easier for us to make and manage my collections on pc. According to Amazon Help&Cusomer Service, it doesn't support sending collections from computer to iPad. 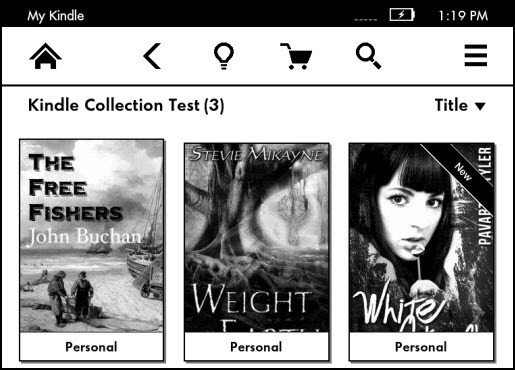 Maybe Kindle Cloud Collections can help you manage kindle books on iPad (iOS app). Step 2: Create new collection. Click "+" and name your collection by eBook author name, date, etc. Drag the books into the collection folder which you create. And you can add epub books from your computer to kindle device by clicking "Add files to Kindle" icon. Because it will automatically convert epub books to mobi. But it will load DRM epub books in failure. Download DRMed epub to mobi converter alternative can help us make it. Note: The Kindlian just offer Window version. As a mac user, Scida offer us a way to organize eBooks and manage our kindle device. The method 3 also works with non Amazon books. I will demonstrate a proper way to manage your kindle books and group books together into unique collections. 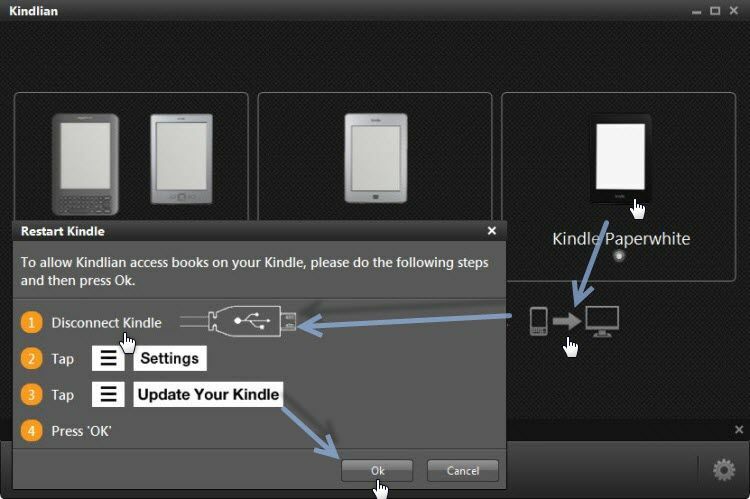 The following steps will take Kindle Paperwhite as example. Here is a full guide which teaches you how to jailbreak Kindle Paperwhite step by step. 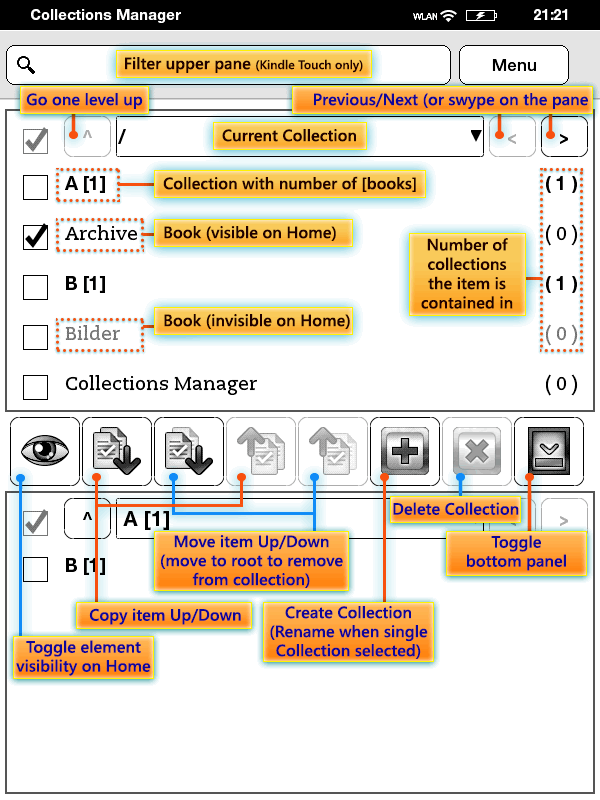 Download Kindle Collections Manager here. Plug you kindle paperwhite into your host computer. Unzip the CollectionsManager_2.8.1.zip. Copy CollectionsManager.azw2 from this zip file to the document directory of the Paperwhite. (For my computer, it should be placed in H:\documents\). Disconnect your kindle paperwhite and go forward to click the Kindle collections manager to launch it. If you fail to open the CollectionsManager.azw2, make sure you have followed our Paperwhite Jailbreak guide. If you get any problem, please leave your comment. In fact, if you just want to manage your kindle books on the Paperwhite, there is no need to follow this step 3. 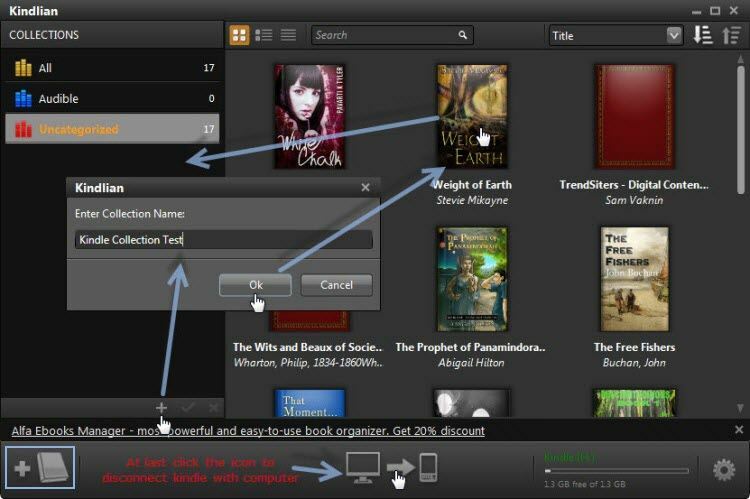 By installing Calibre plugin, we can manage kindle books via Calibre. There are two plugin versions for Calibre: One for Kindle Touch/Kindle Paperwhite; One for Kindle/Kindle Keyboard. Just go forward to "Preference"-->"Plugins"-->"Get new plugins". 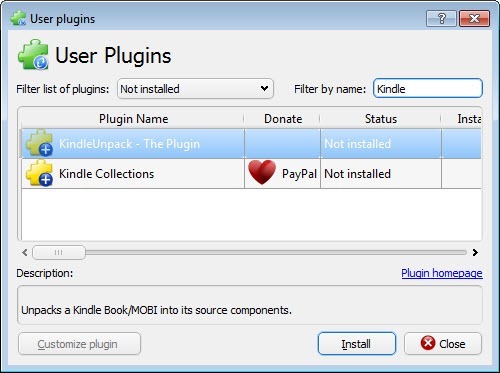 Locate "Kindle Collections" plugins and click "Install" button. 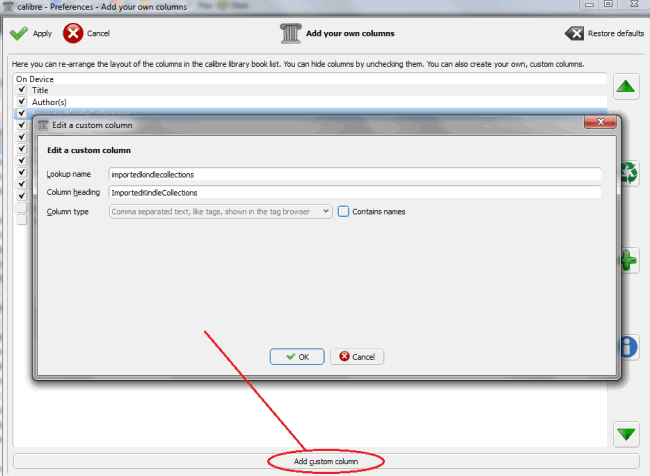 Refer this guide about how to add plugin to calibre step by step. Download the plugin called "Kindle Collections.zip ". Navigate to "Preference"-->"Plugins"-->"Load plugin from file". Browser the location of "Kindle Collections.zip". And select it and add this zip file to calibre. Refer to this guide about how to load plugin into Calibre step by step. Make sure you have plug your kindle into the host computer. Navigate to "device"-->"Show books in the main memory of the device". At last, add all books to library by right clicking. Navigate to "Preferences"-->"Change Calibre Behavior"-->"Add your own columns"-->"Add custom column". 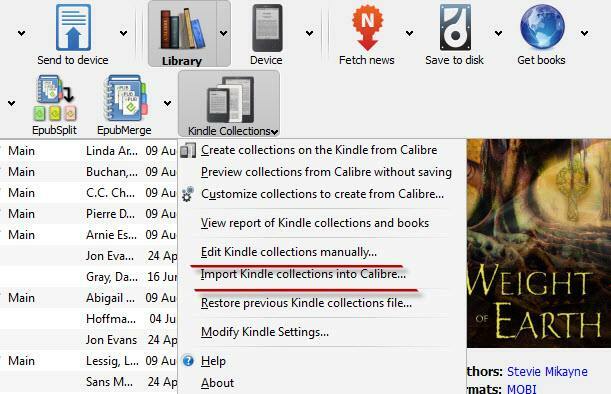 Once you have created the custom column successfully, navigate to Kindle Collections from the main menu and choose "Import Kindle collections to Calibre..." from the drop down list. Go forward to Kindle Collections icon-->"Edit Kindle collections manually...". You will see a list of Collections and you can delete/add a collection to the list. And you can rename the collection. Once you have kept your collections in order, click "Save" button and save collections to your kindle paperwhite. Then it will prompt to restart the Kindle. Eject the Kindle from your computer and navigate to "Home" menu-->"Setting"-->"menu"-->"Restart". Finally, it will save the new collections to Kindle paperwhite. Compared with the method 3, the method 4 is too complicated to operate. But both methods can be applied to Amazon purchased books and non Amazon books. 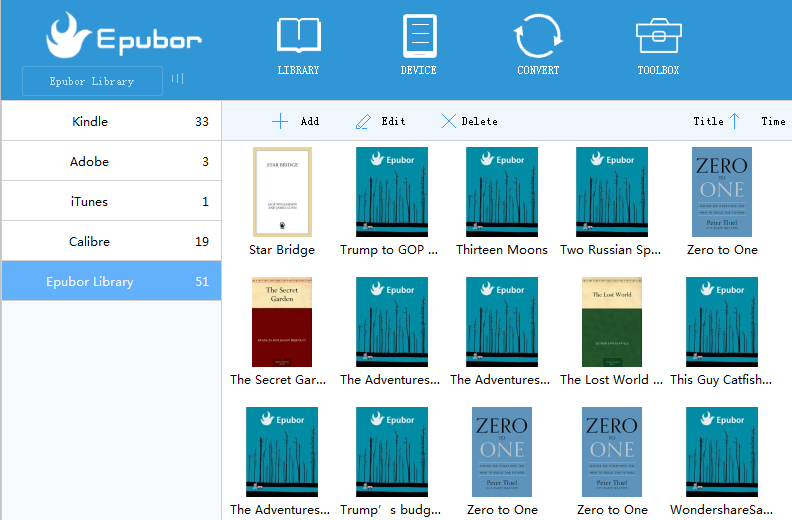 And if you think these methods are too difficult to follow, maybe you can have a good look at this new tool (I found it interesting): Epubor eBook manager. It helps manage kindle collection by editing, adding, creating, copying, renaming, and more powerful functions that your kindle books will like. It's totally free. Please note that Kindlian does not yet support firmware 5.3.7.2 or higher. I'm truly bummed as I've just wasted an hour trying to get it to work on my 5.6.1.0.2. Now to get a refund. Yes, you are right, Kindlian do not support the latest version of Kindle. When we find better software, we will tell you. 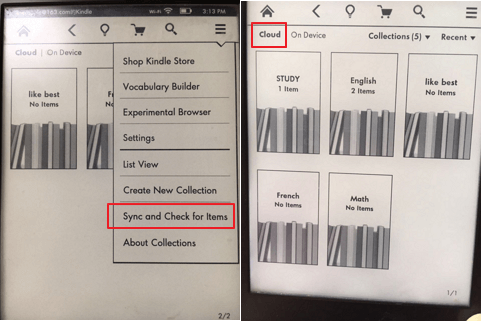 After updating a collection in kindle device with kindlian, is this collection working in kindle cloud? Thank you! I don't think it will affects the collections in cloud, however, you can verity with their staff. 1) I see a collection on my kindle with 65 books. This what I indend. However, I also see those same books outside of that collection, so the point of the collection is lost !! What method you used? I want to do it for my Kindle keyboard. kdeasy is not allowing collection management on paperwhite despite the firmware being 5.4.3.2 ...any idea why? I have a kindle paperwhite 5th generation but method 2 doesn't work. I have no "import collections" option. Method 1 is what I use but to say it's only the books you purchase from Amazon is WRONG. Maybe involving the cloud yes but I HATE the cloud. I download books from the library or torrents. I turn off the cloud permanently and arrange my books into collections as I go. So to add another 1 to 3 books is no biggie. Sadly on my side my new Kindle Oasis does not show up in the dialog window for importing collection to Kindle for PC. I do use last version 1.17.1 on Windows 10. Is there an issue on my side? I just would like to import my Kindle Oasis collection on my laptop. I can't make method 3 (Kindlian) work. I have a paperwhite 3. I download and run Kindlian. I select "Paperwhite 3" as my device type. The popup that you show comes up ( disconnect kindle, tap settings, tap update your device, press ok ). I disconnect my kindle, press settings - there is no "update your kindle" option. I can tap "device options" and get a menu that includes "update your kindle" but it is greyed out and cannot be selected. I believe that "update your kindle" is only available if there is a new bin file in the home device directory. I know that is the case with actual kindle manual updates - you download the bin file from Amazon, copy them into the kindle home directory, and then and only then will the "update your Kindle" option become active. So, did you actually perform the Kindlian installation? Does it not work on Paperwhite 3's ??? Was a step left out of your instructions? Please clarify. Yes, I'm having the same problem. Kindlian tech support said that the latest (?) firmware - I have 5.8.9.2 (May 2017) - has closed off 3rd-party access to the Kindle. I really don’t understand why Amazon is making it so difficult to manage the content we buy from them. The Kindle interface is really kludgy, despite several years of incremental developments. Managing content on their website or via the Kindle Reader app is completely useless. They’re too lazy (or incompetent) to develop easy-to-use interfaces, so why do they care if someone else does a better job??? I'm waiting for a response from Kindlean, but I would suspect that we would have to downgrade the Kindle firmware for it to work. Remember digital picture frames? They all could hold thousands of pictures but none had any easy method of ordering - and therefore accessing - this mass of data. Consequently, these devices have become shelfware. The need was so obvious but not one single manufacturer chose to address this critical limitation. Now we have e-readers, most particularly Kindles. Again, able to easily contain thousands of books but after being on the market for years still offering no real method of organizing and accessing your library. In this case, they continue to be bought and used because they are sooooo convenient for reading. I have several hundred books but I never load more than 10 to 20 at any time on my Paperwhite because I am not about to manually page through 500 books eight at time when trying to find something. That would be something on the order of 62+ pages with no organization. I continue to be amazed that Amazon neither offers any CONVENIENT method to organize your library NOR will open the firmware to third-party developers. This is so frustrating....... and so unnecessary. Can you possibly explain why this situation exists? Since you specialize in e-readers I thought that if anyone could explain this absurdity you could. I would REALLY appreciate a response, and I think others would as well. I'd be happy to ditch my Kindle device completely and buy another device from a different manufacturer if they made it simpler and more intuitive. It's not that difficult to rip all the content onto my local disk and then upload it to a different device if necessary. Any ideas of non-Amazon readers that would be suitable? 5.7.4 could jailbreak, but CollectionsManager.azw2 does not support this version. BTW, I could download "Kindle Collections.zip"plgin. I have a Kindle Gen8 KT3 running FW 5.8.0. I downgraded it from 5.8.9 and Jail broke it. When I install Collections Manager from above, I get an message on my screen saying FW 5.8.0 is not compatible with this version of Collections Manager. Any suggestion on a newer version? Perhaps I'm Lucky bt I have had no real problems in putting most of my kindle books (700 titles) into about 45 categories (colections)in the kindle app on my computer. I usually access the book I want to read on my computer first so that it is my current book when accessing on my tablet or phone. The problem arises in trying to place books into my collections because the category (collections) list is in the order in which I created each category (collection)instead of Alphabetical order but I can find no way of reordering that list short of deleting the collcetions and re-creating them in alphabetical order. then I'd probably have to manually re-enter every book. A really good addition to this 'tool' would be to be able to tag a number of books and then add them to a collection with juar one 'enter / add' command. Can items listed on my contents be deleted from the list once they are in collections folder?